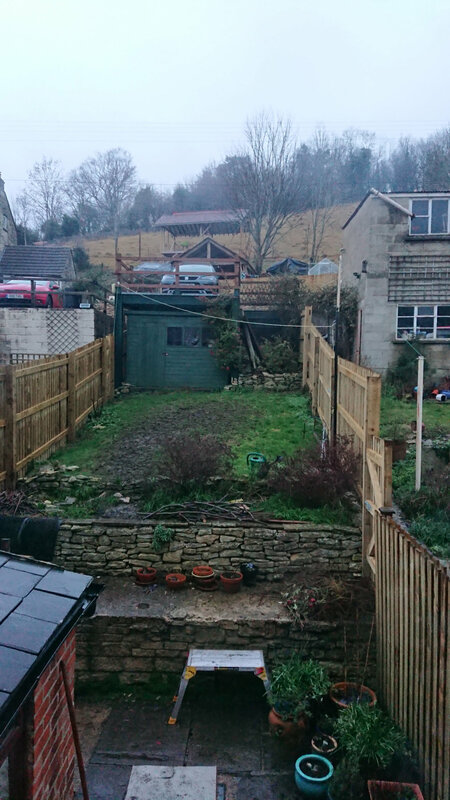 Just before Christmas we moved to a lovely Victorian terrace in the Cotswolds. The house is on a hill, and we have a small garden, which slopes from the back of the house up to about first floor height at the end of the garden. I managed to take a couple of photos just before it got dark, the first is from an upstairs window, then the second is from the patio to give an idea of the height. We have a rather impressive steel structure for parking the car on, the shed is neatly tucked underneath. There is space behind the shed, under the parking which is currently planted with ferns and similar as its a sheltered, shady but warm spot in the summer. Previous owners had a hammock under there. As you can see, our dogs completely trash the lawn when it is wet! I'd like minimise the lawn area, have a tree or two - crabapple/cherry maybe. I plan to climb something up the steel supports - Clematis perhaps, and would like flower beds of some sort (raised perhaps) ... But having never designed a garden before and not having much in the way of budget, I don't even know where to begin! Access is very tricky so no major earthworks! Any ideas or suggestions / food for thought are most welcome! You have lovely stone walls, Siananigans. You could grow plants in pots on that "step" while you're deciding on an overall plan, perhaps... presumably there are steps up to the top level? Unless you're sure what's growing in your garden already, you might do well to hold fire until things come into growth, and see whether you like what's there, before making your plans. I don't have dogs so I don't know what you'll need in terms of an area set aside so that they don't trash the lot... perhaps someone who incorporates "doggy space" in their garden could advise you on that. If that metal step is the only way to get up onto the lawned area, the first thing I would do is build some proper steps and stabilise the top of the wall. And seriously think about lifting the grass and making a curvy path up to the shed with a circular seating area in the middle and the rest in planted borders. With some climbers along both fences. Have a look on Ama*on and buy a/some books on small garden design. They are not very expensive and will give you lots of ideas, not only on design but how to measure your garden etc etc. Which way does your garden face - north, south, east or west? Does that gate on the right of the first 'terrace' lead out to a path up to the car parking area? Or is there another route up? Are you in the Stroud Valleys? Do your dogs need space to run in the garden or is it just because it's there? Do you want to grow vegetables? As Liriodendron says, it's a good idea with a new garden to wait and see what appears in Spring and Summer before you get stuck in - wouldn't want to dig up something lovely you don't know you have. But just a few general points, I'd advise against gravel - it sticks to dogs paws when it's wet and they bring it into the house, which'll do your hoover no good at all (we've had two dead ones as a result of that particular mistake). I'd pick one tree and go with that - maybe something like a weeping form of cherry as you're looking up at it from the house. There's not really room for two trees to have distinct form you can appreciate. Your soil will be very limey, which will affect which plants you can grow - there are lots that love it so it's not a problem, but it's important to be aware of it so you don't waste money on plants that won't survive. The garden points north, but faces south hahaha with being on the hill, I hope that makes sense! It was very sunny when we first viewed in the summer and even October when we viewed again (it was a long drawn out process) the patio gets next to no sun ever as is in the shadow of the house. We are indeed in the stroud valleys. The gate on right goes into next door (existing right of way that had to be maintained) there is a gate on the left with shared path up to parking at the back. The dogs don't really need to be ble to run in the garden, they generally just potter out there, and have the occasional mad dash which trashes a wet lawn! I've never grown veg before, though have had some success with tomatoes and chillis, but might like to try if we could create some sort of beds. I know what you mean re gravel, also want to avoid it as plenty cats around here and I am very wary of creating a litter tray! Thanks for the tip re: limey soil. Currently that step is the only way, before we put the fence up you could access it from the shared path on the left. But we had to secure the garden for the doggos. I like the curvy path and seating area idea. I feel like it's just a empty rectangle at the moment, and I know a lot of that is to do with it being winter, so will wait and see what this spring/summer holds and go from there! We lived in Nailsworth and then Woodchester for many years So a few things that I learned there which may or may not be true where you are then - the soil was quite shallow and the stone very soft (I can see yours is beginning to break a little at the edge of the step onto the first terrace). We did have a cherry tree in our garden - planted by previous owner - and it grew well enough but was never healthy despite my best efforts - it just didn't like the soil. You might do better with something like a strawberry tree (Arbutus × andrachnoides), which also has the advantage of being evergreen. As long as you're not on the top of Minch or up at The Camp (or, heaven forbid, on the Birdlip), where it would be too cold, it would probably be hardy enough. Climber - I had a grapevine growing outside - it thrived, absolutely loved it. Lavender will probably grow like topsy for you, as will most of the Mediterranean herbs. Philadelphus also grew really well - almost too well - and lilac. More generally, presumably you can't plant up that first terrace as you have to maintain the right of way reasonably clear, so a few pots, well weighted down so the dogs can't knock them off is definitely the way to go. The second terrace though, could have some reasonably big shrubs to give more winter structure. When you build your new steps, make them wide and make sure you have a proper handrail - you can see the green growing on the bottom of the wall by the patio. There are hardly any surfaces that won't get slippery in winter with no sun on them, so you need a strong handrail to grab. Steep steps would be treacherous. DON'T make the treads from wood/decking. I'd be tempted to make a couple of wide terraces where you have your pots on the patio on the right, so you can plant up the edges facing the house. Make a seating area at the top, in the sunshine and make the walk up there as simple as you can so you can carry a tray with food/drinks up there without going a**e over appetite on the way up/down. If you hire a turf stripper, you can get most of the grass up and make a 'turf stack' ( https://vergettegardens.com/2014/04/15/how-to-make-a-turf-stack/ ). 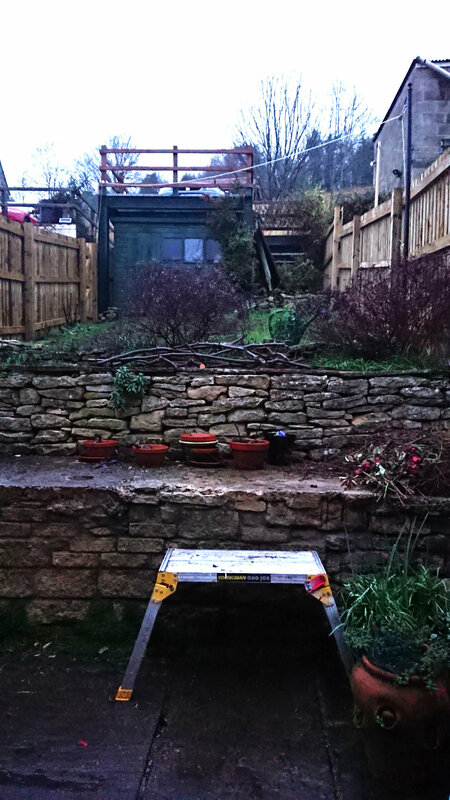 Then build up the upper wall a little and level that top section using the top soil you'll have made from the old grass. Do you have to walk through the garden to get to the house after you've parked the car? If so, a good all-weather path and steps should be top priority, and I think I would want to include some lighting. I may get grief for saying this (and to be honest, l wouldn't usually), but do you want to keep the lawn? I can picture a kind of patio design with a sunburst type pattern in the middle of it, with beds around the outside, or even just large pots. I agree about the steps, the wider the better, and the handrail. But having never designed a garden before and not having much in the way of budget, I don't even know where to begin! Summer fetes are the place to be if you need to pick up plants for not much money. We've had really good stuff for just a pound or two. Nope, we have a shared path that runs down the other side of the fence on the left. The path is lit, but I would like some lighting in the garden too for sure. Good! That means you can take your time with the design. I agree with AnniD about not having a lawn, unless you really love it and can stop the dogs from trashing it. If it were mine (and bear in mind I'm a bit of a plantaholic) I would want nice wide steps for safe access, and a path up towards the shed with maybe a paved central feature and nice wide beds either side to give maximum scope for planting.